I've been a life-long liberal and often criticize the Right and Far Right and Alt-Right - and their enablers like Steven Pinker - on this blog. But I also have a problem with the Far Left. As much as I would like to believe that only the Right has a problem with living in their own Bizarro World, it's undeniable that the Far Left is almost as bad. This was underlined for me when I encountered so many supporters of Bernie Sanders who were completely unconcerned about the practical, real-world conditions that might prevent Sanders from achieving all their socialist dreams, should he be elected. They seemed to assume Sanders would simply wave a magic wand and all Republican opposition, to things like single-payer healthcare, would disappear, unlike that loser Obama, who was not sufficiently able to magically alter time and space enough to please Berniebros and their handmaidens. And they often became enraged with anyone who had the bad form to point out the practical real world problems. But long before Berniebros it was clear to me that the Far Left would never find acceptable any person capable of winning enough votes to become president of the United States. And here is a member of Rose Twitter (socialists on Twitter who indicate their position with a red rose icon) to illustrate my point exactly. 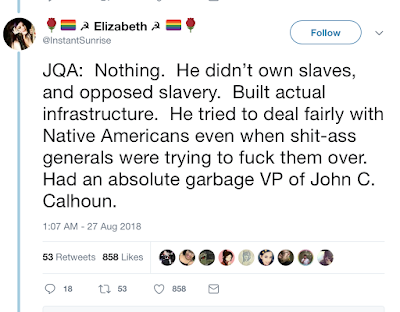 UPDATE: except, apparently, John Quincy Adams. 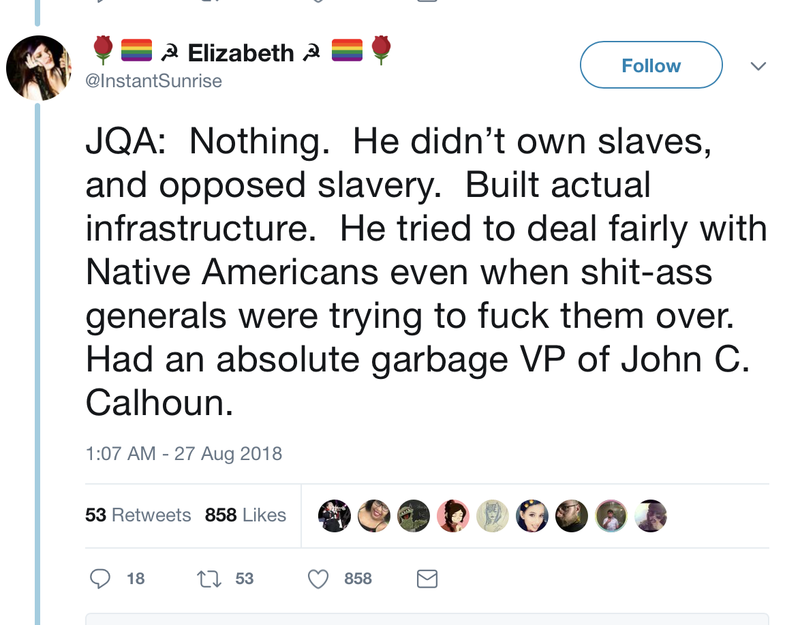 But I am sure that had Elizabeth and the other Berniebros & handmaidens been around during the JQ Adams presidency they would not be content that he simply "opposed" slavery, they would be asking why he didn't immediately, successfully abolish slavery upon becoming president.